John Winthrop, in 1630, obtained the Massachusetts Bay Charter from King Charles of England. He and the nine-hundred Puritans that followed used the charter to divorce from a religion that seemed to have lost its Christian principles. The Charter granted the Puritans the land area known as Massachusetts, after the original Indian tribe, and the distance over an ocean provided the freedom to practice their religion. Not to be left on shore, British Common Law sailed on John Winthrop's eleven ships. The Puritans brought with them the English legal system that became the foundation for today's common law. Consequently the concept of coroner arrived in America on the Arabella, Winthrop's command ship. The function of coroner came from a derivative of the word “crown” and was originally spelled “coroune.” A coroner initially supervised the English court system to financially protect the Crown. Between the 13th and 14th Century crime was rampant in England. Famine, migration, consolidation of wealth and power attributed to the rise in violence. To this point in time, the coroner conducted investigations into fraud, taxes, and facts that would support litigation. To meet the escalating volumes of violent events the coroner's function adapted to address unexpected deaths. From the 14th Century to Colonial Boston, the coroner immediately convened an inquest jury (usually thirteen men) to pre-judge the facts leading to a sudden or suspicious death. A secondary role for the coroner was to inquire and confirm the identity of an abandoned body. By Paul Revere’s birth, on or around January 1, 1735, Boston was transitioning from the Julian to Gregorian calendar. Consequently, ten days may have been lost to his history. Regardless, the function of a coroner had fully matured by then. Sixty-two years later Paul Revere would apply for the role of coroner. His first inquest was February 21, 1796. By the way, the average life expectancy of men was fifty-six years in Colonial Boston. With this in mind, we set off to learn his motivation to become a coroner. In our pursuit, we stumbled on three themes in the forty-six inquests completed by Paul Revere. We shall reveal them later in our writing. Below is our frame of reference based on the bibliographies listed below and the common themes among them. Paul, as a nonprofessional dentist, practiced it under Dr. John Baker an imigre' from London. Dr. Baker, a surgeon, was highly respected and a great teacher. He fashioned George Washington’s false teeth. Today we would classify Paul Revere as a dental technician, but then he helped patients with tooth discomfort and innovative but rudimentary dental bridges. 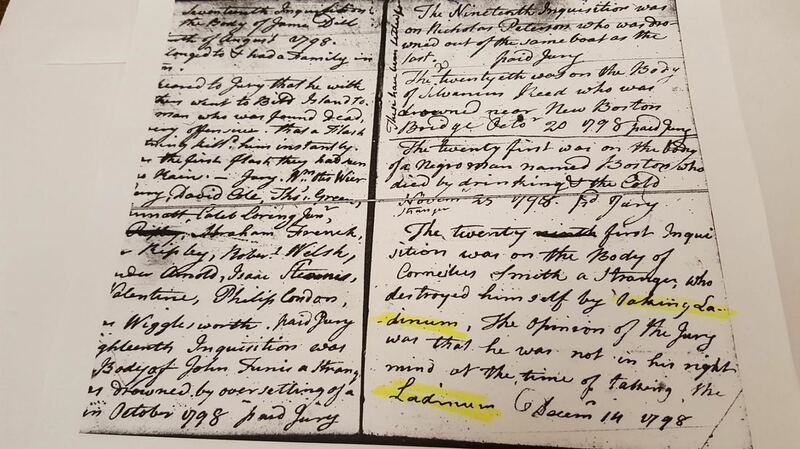 Paul had to identify the remains of his best friend, Dr. Joseph Warren nine months after the British buried him in a common shallow grave on Bunker (Breed’s) Hill. Pinpointing Dr. Warren by his false teeth was the first time dental records were used to identify a corpse. He may have been instrumental in changing medical practices by standing up to the selectmen of Boston, as several of his children developed smallpox. He refused to send his children to a “pesthouse.”[ii] They all survived, though, Mary, born one month into their quarantine died within the year. With the above practical experience, Paul Revere established the first Board of Health in America in 1799. He became president and chairman. As to his motivation, it appears from his account books that he didn’t need the money. More likely his determination to be accepted as an Esquire in Boston society was his primary objective to become a coroner. There were nineteen doctors in Boston treating sixteen-thousand citizens. It appears that any one of them cherished the opportunity to conduct a post-mortem. Holding an inquest, arranging for a jury and making a judgment on the accused was left to others. And so the opportunity was available for Paul Revere. He served for nearly four years. The results of the forty-six inquests in Paul’s handwriting are available from the Massachusetts Historical Society microfilm library. A sample is embedded below. His notes described the sudden cause of death, the jurors seated, their judgment and if they were paid for their services. There were three themes among the forty-six sudden deaths based on the juries decisions. Drowning was a major problem. Our blog on swimming may provide background information that may bewilder you, as Boston was such a nautical society. Secondly, suicide and murder, generally by opium, was common in this religious community. In its liquid form of Laudanum was readily available to treat or permanently eliminate physical or mental pain. Imaged below is a PDF file attempting to detail all of Paul Revere’s inquests. Though he was the best of artisans, we had difficulty reading all of the names of the deceased. If anyone gets close to this, please help us with the victim's full identity. Thirdly, in this Puritan community in a moral state of change, infanticide was a major issue. Society no longer saw the man as the innocent party in a birth outside of marriage. We will expand on all three themes mentioned above in a separate blog coming soon. You can sign up for our mailing list to receive notices of additional postings. Paul Revere graciously resigned from the coroner's position suggesting he did not have the time to properly do the task. Page two of the matrix below may confirm just this as vital, detail was missing. Time must have caught up with him, though he did not officially retire from his foundry business for another twelve years. [i] The Revere Copper Company now resides in Troy New York but has not forgotten its heritage. [i][i] Forbes, Esther. Paul Revere & the World He Lived in. Vol. 1. Boston: Houghton Mifflin, 1942. Print and online p. 77. Forbes, Esther. Paul Revere & the World He Lived in. Vol. 1. Boston: Houghton Mifflin, 1942. Print. Fischer, David Hackett, Paul Revere’s ride. Norwalk, CT. Easton Press 1996. Print. Han, Shin-Kap. "THE OTHER RIDE OF PAUL REVERE: THE BROKERAGE ROLE IN THE MAKING OF THE AMERICAN REVOLUTION*." © 2009 Mobilization: An International Quarterly 14(2): 143-162 14.2 (2009): 143-162. Print. Healy, Kieran. "Using Metadata to Find Paul Revere: Kieranhealy.org." Using Metadata to Find Paul Revere. Blog, 9 June 2013. Web. 18 Aug. 2015. "H-Net Reviews." H-Net Reviews. If There Is Additional Discussion of This Review, You May Access It through the List Discussion Logs At: Http://h-net.msu.edu/cgi-bin/logbrowse.pl. Citation: Allan Branstiter. Review of Martello, Robert, Midnight Ride, Industrial Dawn: Paul Revere and Th, 1 Sept. 2012. Web. 17 Nov. 2015. Martello, Robert. Midnight ride, industrial dawn: Paul Revere and the growth of American enterprise. Baltimore: Md., 2010. Print. Massachusetts State Archives, vole 14.Suffolk Collection, Microfilm volume 692, 693 and 702, cases 107545 and 107566 and 108204 cases, Skillmore, Wellman and Jefre & Hannah Porter. Acknowledgement to Elizabeth Bouvier of the Massachusetts Superior Court for her assistance finding the actual court records involving the deaths by infanticide. The 18th-22nd inquests, 3 drownings and two suicides. Drowning is a worldwide issue today. In the 18th Century opium was monopolized by imperial governments as a source of revenue. Next blog speaks directly to infanticide in a Puritan "City on the Hill." ​10/15/2016 Thank you so much for the Boston Massacre Tour. I never knew it was such a complicated affair. I particularly liked the incidental historical stops about Colonial Boston. I hadn't been downtown for years. You opened up so much for me. June, Natick Ma. AN ASSOCIATION OF TOURS FOR EDUCATORS, AMATEURS HISTORIANS, AND THE GENERAL PUBLIC LOOKING TO WALK BEYOND THE FREEDOM TRAIL. CONCENTRATING ON THE LEGAL, PHILOSOPHICAL, EMOTIONAL AND POLITICAL EVENTS OF BOSTON.